I finished reading this week THE book I would recommend on the current energy and climate issues. Its author – Thomas Friedman – is a columnist for the New York Times and received three times the Pulitzer Prize. To him, the various crises we are facing should not only be considered as a threat but also as an opportunity to launch a Green Revolution that would renew the United States and help the world in solving its current issues. 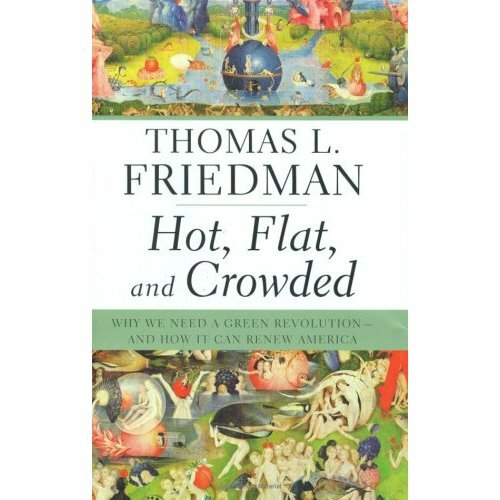 Very recent as it was published in September 2008, Hot, Flat and Crowded is an excellent read that will bring you a lot of knowledge to fully grasp the world we have to build. Hot, because of climate change. Indeed, global average temperatures are increasing and are due to keep on doing so more or less because of our greenhouse gases emissions. Flat refers to the birth of a truly global middle class. Even if this a good news for our societies, this might be bad news for our Planet as more people put more pressure on our natural resources. Crowded as populations projections are forecasting a global population of nine billion by mid century. Since we are already in quite a mess with “only” 6.7 billion, one can wonder what the world would look like with these additional populations. Addiction to foreign oil. Warming our atmosphere is not the only problem posed by oil: most of what is consumed in the US come from the Middle East, and from what Friedman refers to as ” petrodictators ” : adversaries of the American way of life as they fund terrorists. Climate change. I guess I don’t need to explain this one. If you need more on that topic please refer to Climate change keeps on accelerating as well as 10 billion tonnes of carbon. Biodiversity loss. I wrote about it before and will get back to it soon as this book brings a lot of great data. Energy poverty. There are at least 1.6 billion people without electricity on this planet. If these people were to use fossil fuels, it would lead to big problems. This is why we have to bring them clean and cheap electrons with renewables. Decreasing natural resources. Oil, natural gas and many others raw materials see their reserves being depleted by current consumption rates. This will be an even bigger problem in the future. For all these factors we are entering the Energy Climate Era. This will continue the Industrial Revolution but in more sustainable ways by tackling all five threats. The Green Revolution will bring forward solutions like energy efficiency and conservation, renewables and many more. To Friedman, the country – or group of countries, cf. the European Union – who will be the market leader in this industry will make a lot of money. Competition will be fierce as Clean Tech might be the next IT. Other topics: We are not paying the real price of energy as externalities such as climate change, air pollution and national insecurity are not included in the prices. This is why taxes should be implemented to reflect all these externalities. A tax on carbon and many other solutions exist and the author review them all. Almost each of the 17 chapters of this great book is worth an article on this blog. As a matter of fact, the chapters on energy poverty and biodiversity loss will help me to write articles on these topics. The author also coined an expression I particularly liked: ” Global weirding “. Indeed, Earth’s climate is getting weirder and as the IPCC forecast last year, extreme weather episodes are taking place: large droughts, excessive winds – like the ones we had in France this month – etc. It is worth noting that if Jared Diamond was promoting the actions of the WWF in Collapse, how societies choose to fail or succeed, Thomas Friedman strongly advertises for Conservation International. Conclusion : All these elements drive me to truly recommend you this book. Friedman provides realistic solutions, all of them being already applied at a local level. Grade: 18/20. Excellent book, but a bit too much centered on America. Must understandable. Re-readibility: Some quotes are worth reading and again, but the book as a whole isn’t that much. Guess that I may read this again in 25 years. Many thanks to Franke James for her brilliant review. How do we overcome economic collapse and implement Thomas Friedman’s recommendations? In a transparent and public proposal to the Obama team, SLDI has offered a public-private partnership, its Sustainable Land Development Best Practices System, and the breadth of its research and collective knowledge to combat the country’s economic woes, enhance environmental stewardship and increase social responsibility – all at the same time. SLDI, a developer-led and cooperatively-owned technology and information resource association, is now fully positioned to transform the industry that creates the very infrastructure of our civilization. Sustainable development starts with our global infrastructure. If it is unsustainable, ultimately nothing else can be. Featured products and services include green building technology, clean energy technology, ecosystem restoration, carbon sequestration technology, soil enhancement technology, water purification and retention technology, sustainable land development best practices systems and certification programs. Your participation and comments are welcome. Promoting and enabling land development worldwide that balances the needs of people, planet & profit – for today and future generations. This does look like a great book. Thanks for a great review. I’ve just finished Agenda for a Sustainable America over the weekend, and was looking for more on the topic. Agenda is an excellent book as well, a collection of essays by 41 environmental experts that provides both policy analysis and practical solutions to many of the problems facing America and the world.